An identical chair from the collection of the National Museum of Stockholm is illustrated in P. Siguret, ed. Lo Stile Luigi XVI, Milan, 1965, p. 11. A closely related set of six chaises by Jacob was sold Sotheby's Monaco, 23 February 1986, lot 878; another chaise with trellis back by Jacob is illustrated in J. Nicolay, L'Art et la Manière des Maîtres Ébénistes Français au XVIII Siècle, 1976, p. 231, fig. Y. 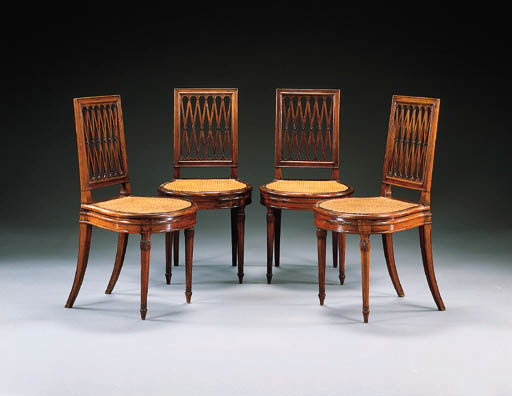 These elegant chaises conceived in the fashionable goût anglais of the 1770s clearly relate to contemporary English chair patterns. Thomas Sheraton illustrates chairs with similar trellis backs in The Cabinet-Maker and Upholsterer's Drawing-Book, 1793, pl. 25.